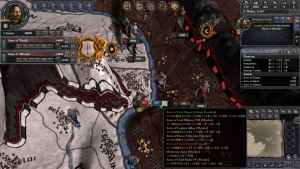 The Middle-Earth Project is a mod for CKII. It is based on The Lord of the Rings, The Silmarillion, and all the other books based in Middle-Earth, written by J.R.R. Tolkien. The mod was created by fans, for fans! This mod is currently in development. There is a full edition available on the Paradox forum. This is a BETA and there will be bugs. Nothing is set in stone and we will appreciate any input that you think might improve the mod. The Fall of Arnor : You're playing during the times of the Witch King of Angmar. The Kingdom of Arnor was split in several kingdoms some centuries before, and the North will know be at war. Try to reclaim the Crown of Arnor as the Heir of Isildur, or try to destroy all the Kingdoms of the North as the Witch-King! The Kinstrife : in Gondor, the young Eldacar was born from a non-Numenorean mother. He's the true Heir of Anarion and of the Crown of Gondor, but some of his kin are talking against him. After all, they're true Numenorean, and not him! The Civil War is among Gondor. The New Shadow : Sauron was destroyed, and Elessar Telcontar is the most powerful king of all Middle-Earth. Immersive Middle Earth experience, including cultural, religious and flavour events in keeping (as far as possible) with the lore and canon. Fully realised Middle Earth map with over 650 land provinces. Full dynasties and histories of Middle Earth, including genetic traits and bloodlines. New playable races including elves, dwarves, orcs, halflings and more. Play through a variety of bookmarks in the Third Age of Middle Earth including the fall of Arnor, the Kinstrife and the War of the Ring. Plots are restricted for certain cultures, some of these restrictions end either when Sauron is destroyed via the ring quest, or if the year is 11390. Some units from certain cultures are very powerful, but there are fewer of them. Others, like orcs, are weaker but there are many more of them. Some events (such as when Mordor or Gondor is conquered and the nobles/provinces change cultures or are expelled MAY lead to a crash to desktop if your computer is a bit dated). The solution is to reload, play at speed 1, and let the event take its course, then you can speed up again. The mod is NOT fully tested for balance. We will need your feedback to get the mix right so it is challenging and fun for all sides. The mod added many new races, traits, and characters from the books. Each races got their own specific portraits for a better immersion into the universe of Middle-Earth. A lot of specific traits were created to the mod, as Legendary Weapons (Anduril, Glamdring, ...), Rings (Rings of Powers, Ring of Barahir, ...), Crowns and lot of objects like them. But the mod add also some cultural, education and personality traits, to be more immersive. Which bookmarks will be available? There are three bookmarks currently available; The Fall of Arnor, The Kinstrife, and the War of the Ring. We also plan to include bookmarks for The Last Alliance, A New Shadow (Fourth Age), The Invasion of the Wainriders, and The Quest for Erebor, but for now we work on stability and expanding the current bookmarks. There is also a First Age 'expansion' in the works. How large will the map be? The map currently covers the main areas of Tolkien's Middle Earth, from the edges of Forodwaith in the North to the Dune Sea in the South, and from the Rhun in the East to Lindon in the West. Numenor and Beleriand are also on the map, sunken beneath the waves, all except a few islands, once mountain peaks. What languages is the mod available in? The mod currently has English and French localisations. There are also Italian, German, Czech and Spanish localisations in development. If you wish to work on localising the mod please PM me or Lonhaldor. Are any DLCs required to run MEP? It is highly recommended to have at least the Old Gods, Republic and the Legacy of Rome for the best experience. It has been! Go and download it! Isn't there another Middle Earth mod? This mod is being developed independently from any other LotR or Middle Earth mods out there. Why doesn't my mod appear in the CK2 launcher? You need to have two things in your "Documents/Paradox Interactive/Crusader Kings II/mod" folder : - The MiddleEarthProject folder - The MiddleEarthProject.mod file If one of these files is missing, please make sure extracted them! If you don't have them in your archive, try to redownload the archive from one of the links in moddb. To be sure to have all your files, use Winrar! I've got blank events, and I can't play at all! This issue occurs as a result of a wrong installation. Please make sure you install the mod in "Documents/Paradox Interactive/Crusader Kings II/mod", and not in the game folder. If you've got this issue, remove your current installation of the mod, and install it as described above. Some weird characters are present, like Emperor William of Mordor instead of Sauron, why? This issue is also because of a wrong installation. Please be sure to install your mod in "Documents/Paradox Interactive/Crusader Kings II/mod", and not in the game folder. If you've got this issue, remove your current installation of the mod, and install it as described above. A list of people who have worked on this mod since development started, and credits for artwork and music. This page was last edited on 28 December 2017, at 19:02.